Last fall I transplanted several cuttings (cared for and rooted by my husband and his green thumb) into my favorite clay pot. These cuttings came from my good friend Paula’s succulent plants and Mar’s Jade plant (the host plant was over 40 years old). With the exception of the Jade plant I don’t know the common or botanical names of these plants. I choose the cuttings based on the shape and texture of leaves to create a pleasing and interesting vignette. My goal was to create a desert-like table top garden so I embellished the plantings with clear marbles and rocks. I was very pleased with the results – shown in the “before” picture – and enjoyed the fruits of my effort through the end of the year. The before – cuttings transplanted in a favorite clay pot. As winter approached we moved this table garden and other tender plants into our 4×8 greenhouse that is located in the “secret” garden in the side yard of our home. 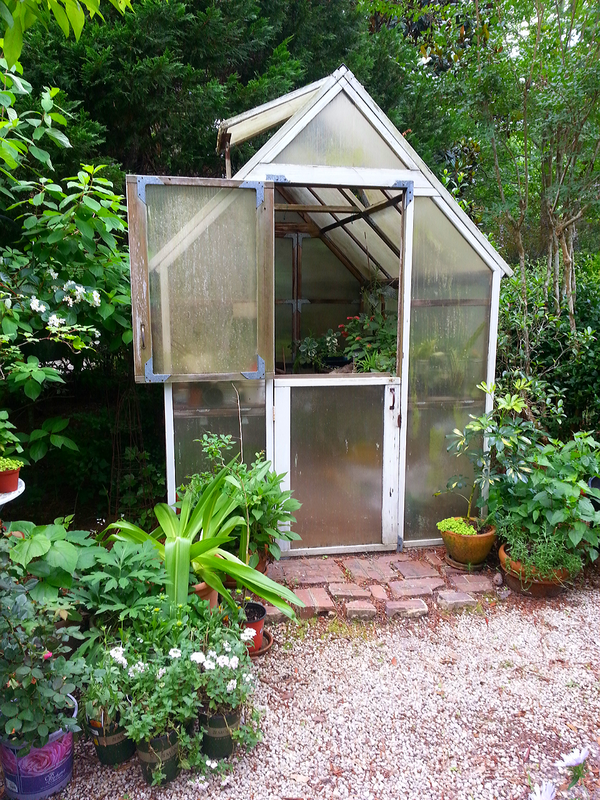 In years past we had adopted a “survival of the fittest” approach to gardening. This past winter was different. We took care when January freezing temperatures arrived (a somewhat rare occurrence in our coastal area) to cover (using old bed linens) and insulate our plants. We were rewarded for our care and effort! My table garden looks more like a luscious succulent bouquet! 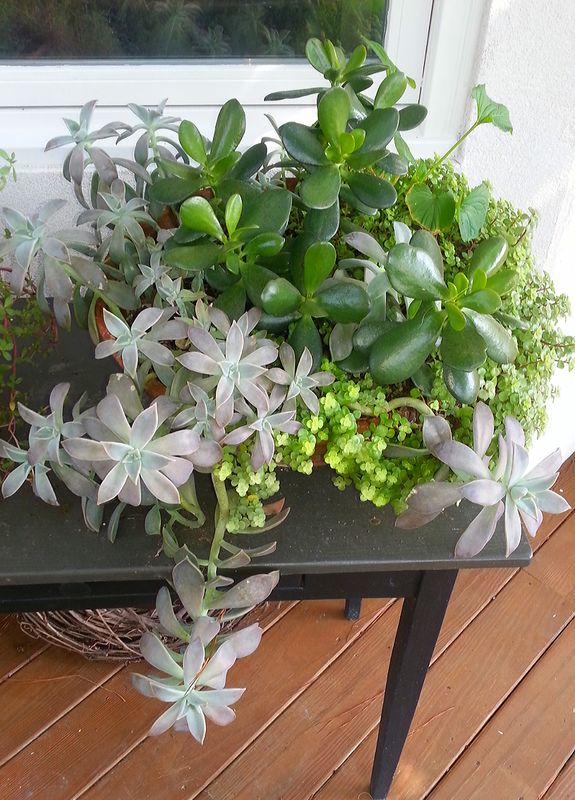 The “after” – a lovely and luscious succulent bouquet! WOW……your desert garden lovely! Kudos! Nice! How fun to create something like this over time and enjoy the results. It has done really well! Thank you! I couldn’t even imagine this result when I planted the little seedlings! I absolutely love succulents! My front and back yards are bursting with them and I keep adding more. They are perfectly suited to our drought conditions; I imagine it’s a bit more challenging to grow them where you live. 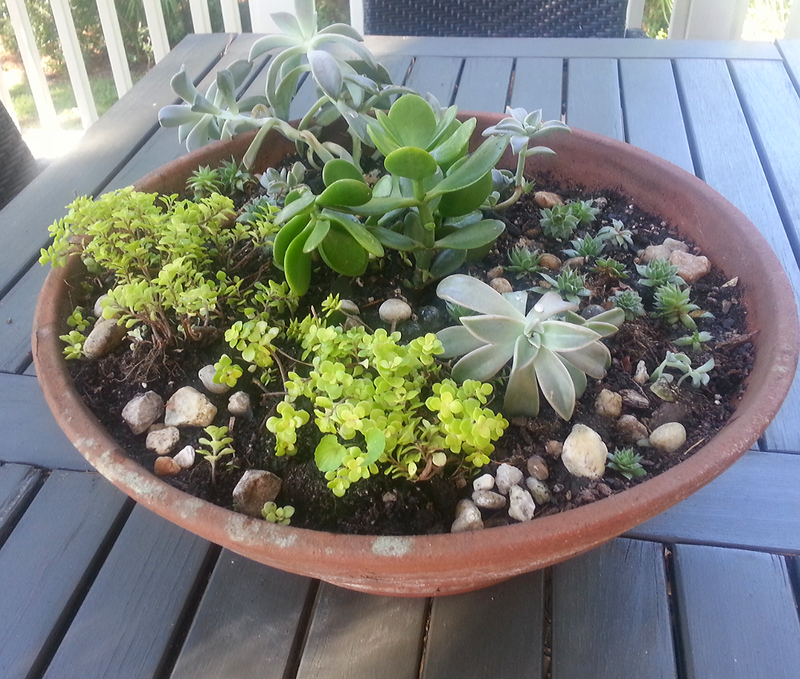 It is wonderful that even in the terrible drought you can grow and enjoy your succulent plants! We are getting quite a bit of rain (possibly hurricane Emily) and we are constantly having to drain our potted plants. But it is worth the effort!